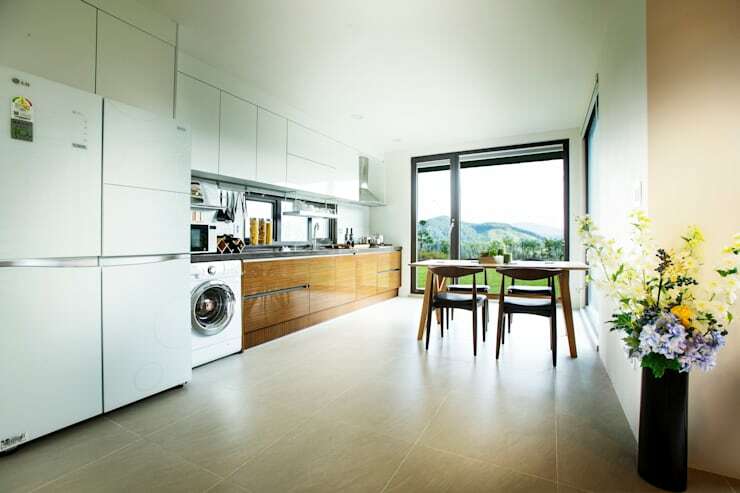 Designed by Hangul House, today's homify 360 is going to knock your socks off. Modern, funky and trendy, this is a home any person would dream of living in, whether they're young or old. This home also fits beautifully into any neighbourhood, bringing a touch of style and rustic glamour to a community. From the inside out, this space channels sustainable chic meets modern masterpiece. So let's go and explore this space, delving into the interior and the exterior to truly understand how these architects have managed to achieve a structure so bold and so beautiful. Our first glimpse of the house shows us just how trendy and modern this space is. Don't you love how different volumes have been created throughout? 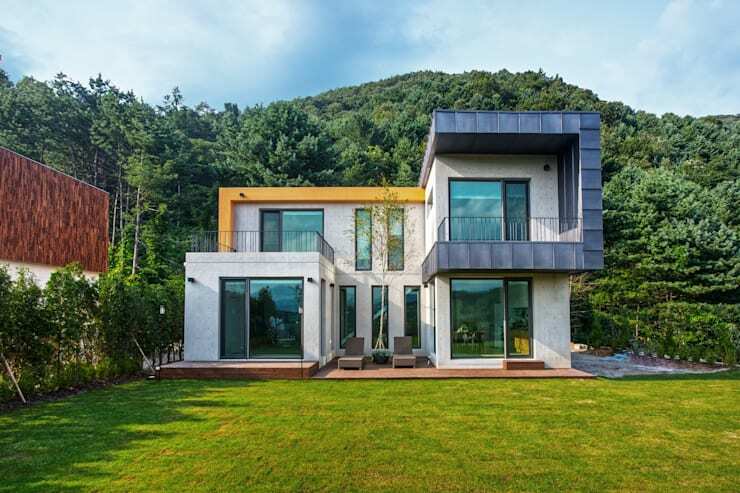 The designers have achieved this by creating one main home at the back of the property and then pulling out different sections of the house in front of it, almost like little blocks protruding out from the main house. Doesn't it remind you of a Tetris game? The designers have also made the most of facades and colour, highlighting different sections of the house with a dark blue/grey as well as yellow. A touch of colour never goes amiss when it comes to an architectural structure that is neutral in colour. Pair beige walls with turquoise shutters or grey walls with a bright red front door—it's up to you! You'll also notice that this home is on a large property with a beautifully manicured lawn. Wide, large glass windows and doors open up onto the garden—simply gorgeous! The interior is just as subtle and stylish as the outside of the home. It has been designed as an open plan space, where the rooms all fold into the next. The most prominent feature, which we saw from the outside of the home, are the large glass windows and doors. They allow natural light to stream into this space, completely opening it up. This works wonderfully with the beige tiled floors and the wooden furniture and staircase. 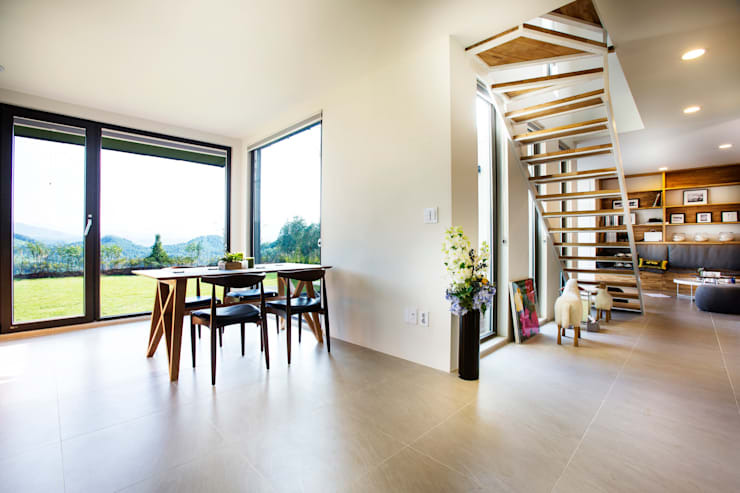 Have a look at this article on bathing your home in natural light. The furniture is very modern and understated—functional and pretty. We also love this big pot of flowers that the designers have added to the space along with a piece of art and some sheep sculptures. You don't simply need to add art to the walls to include it in your home. If we examine this space a little further, it opens up into the kitchen. The kitchen is not overtly big, but it's spacious enough for the kids to do their homework at the table while mom and dad cook or for guests to sip on wine while the chef whips up a feast. The kitchen is a combination of white and wood. The wood adds a warm and earthy tone to the very crisp and clean kitchen. Have a look at these simple tips for tackling kitchen furniture. If we look at the wooden staircase, we can see how the designers have included a bit of character and style in every corner of the home. The staircase itself is a masterpiece, with floating wooden panels that curl up onto the top level. 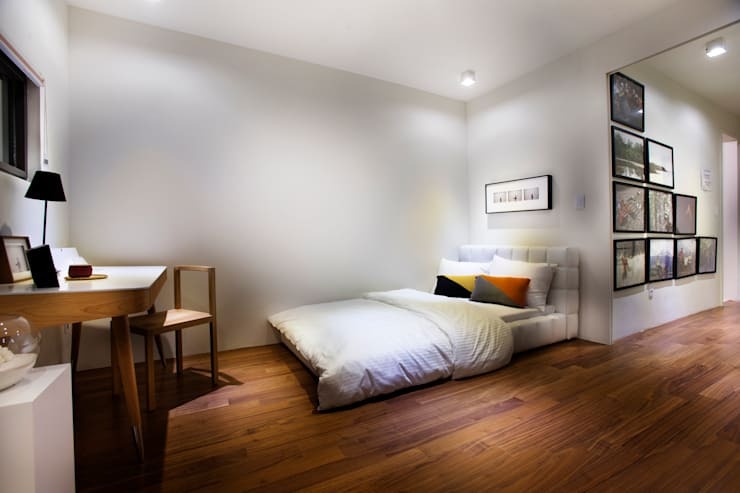 The light, yellow wood contrasts with the white walls. 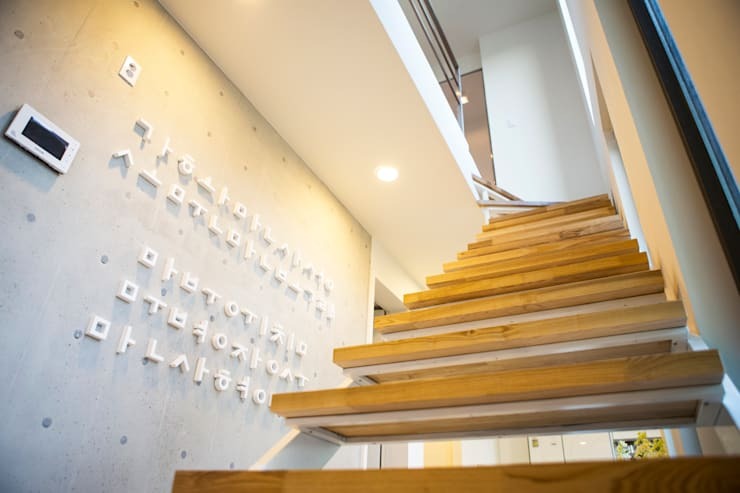 Parallel to the staircase is a detailed wall that features three dimensional writing that simply pops out of the wall. What this shows is just how unique and special a home can be when it comes to decor and design. There is no need to follow the trends—choose items and pieces that are meaningful to you. The bathroom is a space that often gets overlooked in a home but it's an incredibly important part of the house! A bathroom should be a cocoon from the world, where you can read your book in a hot bubble bath, do your make-up and get ready in your own time. 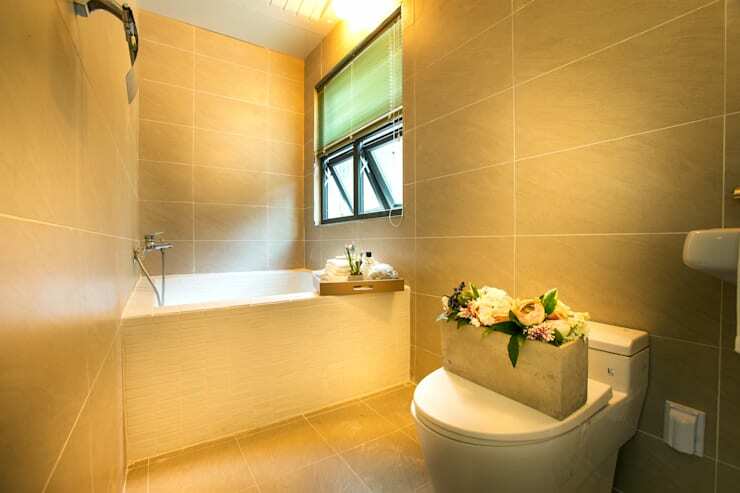 The designers truly understand how much of a haven the bathroom should be, creating a very warm space here. The soft lighting works beautifully with the honey-coloured tiles. They've added a soft, material blind to the window as well for privacy. The little basket of flowers on the toilet and the tray of bath salts, bubble bath and oils just add that extra touch of luxury to the space. Have a look through the homify bathroom products for inspiration for your own bathroom. We end off our tour in one of the bedrooms, where the designers have matched white linen and black picture frames with the wooden floors and wooden furniture. Don't you love the modern white bed, which as been matched with a cushy white duvet? The designers have added a touch of colour in the from of bright cushions. This is a great tip for the bedroom as you can change the colour scheme in the space just by swapping the cushions out. You'll also notice that this space features a collage of photographs that have been blown up. This is a great tip for any home! Add a bit of personality as well as a personal touch in the form of memories and photographs and you'll see how quickly your house transforms into a home. Everything about this home screams sophistication, comfort and trend. Which is your favourite room in this house?